Pu'u Huluhulu means "hairy hill" because it is old enough to be overgrown by foliage (and therefore looks 'hairy' when viewed from afar). This is a nice hike along an interpretive trail to the top of an old cinder cone that is now overgrown with rainforest. With good weather, the top of the Pu'u can be a good vantage point on Pu'u ʻŌʻō, the current eruption site, especially at night or with binoculars or a telephoto lens. This hike crosses lava from Mauna Ulu's 1969-1974 eruption. Don't confuse this Pu'u with another of the same name along the Saddle Road. 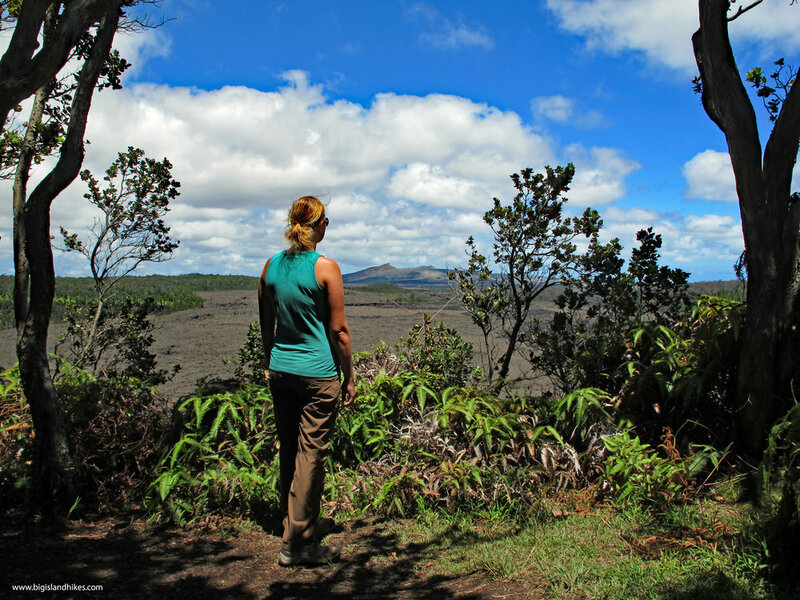 Big Island Hikes features another, longer hike from this trailhead: Nāpau Trail. Trailhead: From the Park entrance, drive about 50 feet and turn south on Crater Rim Drive. Follow Crater Rim Drive to Chain of the Craters Road. On the Chain of the Craters road, find the Mauna Ulu parking area at the end of a short road that departs the main road between the 3 and 4 mile markers. The spur road dead-ends into a roundabout with a small parking area with a restroom. The trailhead has a register. There is sometimes a Ranger or Park volunteer stationed here. There is a pit toilet but no water. Hike: From the parking area, walk to the end of the paved road and find a trail register next to the beginning of the hike. The trail is well-marked with ahu (cairns) as you travel through lava flows from several time periods on the way to the Pu'u. At the base of the Pu'u, climb north for about a hundred feet to a concrete viewing area. Enjoy the view of Pu'u ʻŌʻō, the current eruption site, Mauna Ulu, and the surrounding area. There is a fantastic view of Mauna Loa if the weather is clear. Retrace your steps back to the trailhead. When you return to the trailhead, consider hiking the quick loop to the south to check out some fascinating lava formations. The trailhead isn’t obvious. From the main trailhead with the register, walk the rest of the road until you see another trailhead on the south side of the road. You can do the quick loop in either direction. It will take you past many interesting lava features, including several lava trees. Be sure to check out the colorful lava within some of the vents along the hike. If you started the loop in the forested part, you’ll get dropped off near the road just east of where you started.